In an effort to provide affordable, trusted training for jails in the western states, WSSA and NIJO have joined forces to offer an advanced legal-based jail training program for WSSA members. To accommodate everyone, the seminars will be offered at locations across WSSA territories. All training is approved for National Certification through NIJO for NCCE, NCCS, and NCCO levels. WSSA and NIJO share common ground on defending the office of Sheriff and promoting a sheriff’s best interest on jail issues without regard to political correctness, affiliation or putting organization objectives before the members they serve. 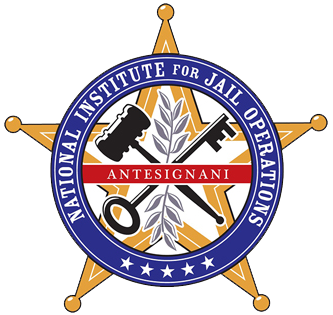 Kansas Sheriffs' Association in partnership with the National Institute for Jail Operations (NIJO) is pleased to announce a new legal-based jail training academy for jail administrators and supervisors in Kansas. To accomodate everyone's busy schedules two 5-Day sessions have been planned to provide individuals with 40 credit hours of NIJO's legal-based training taught by the best corrections experts in the country. DESCRIPTION In collaboration with the Alabama Jail Training Academy, NIJO is excited to announce the next training event to take place. The training is scheduled for May 29-30, 2019 at the Marriott Legends at Capitol Hill in Prattville. Please consider registering yourself or sending additional people from your office. Registration for this event can be found by clicking here. Registration is $75/person. JAILCON offers legal-based training sessions on the hottest topics facing jails and detention facilities today. DESCRIPTION In collaboration with the Alabama Jail Training Academy, NIJO is excited to announce the next training event to take place. The training is scheduled for June 26-27, 2019 at the Marriott Legends at Capitol Hill in Prattville. Please consider registering yourself or sending additional people from your office. Registration for this event can be found by clicking here. Registration is $75/person. JAILCON - THE PREMIERE LEGAL-BASED REGIONAL TRAINING CONFERENCE & EXPO for SHERIFFS, CORRECTIONAL & JAIL ADMINISTRATORS, LINE LEVEL & SUPPORT STAFF offering legal-based training sessions on the hottest topics facing jails and detention facilities today. DESCRIPTION In collaboration with the Alabama Jail Training Academy, NIJO is excited to announce the next training event to take place. The training is scheduled for September 11-12, 2019 at the Marriott Legends at Capitol Hill in Prattville. Please consider registering yourself or sending additional people from your office. Registration for this event can be found by clicking here. Registration is $75/person. DESCRIPTION In collaboration with the Alabama Jail Training Academy, NIJO is excited to announce the next training event to take place. The training is scheduled for October 16-17, 2019 at the Marriott Legends at Capitol Hill in Prattville. Please consider registering yourself or sending additional people from your office. Registration for this event can be found by clicking here. Registration is $75/person.